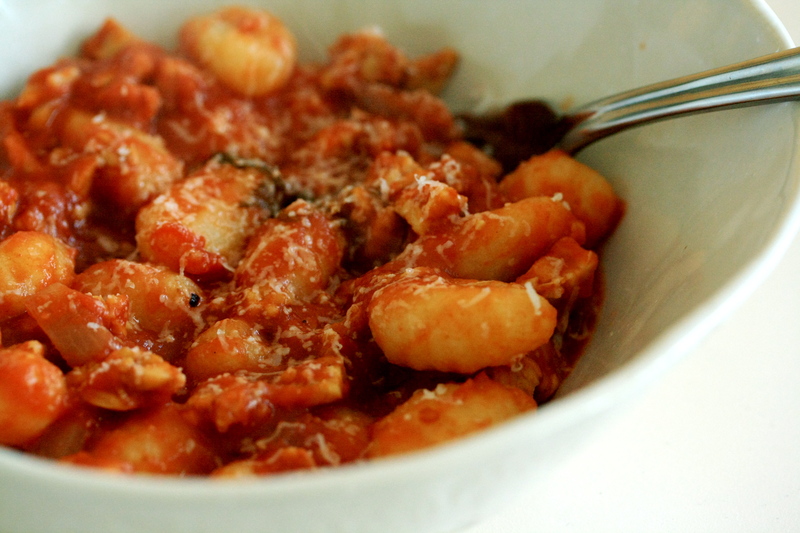 Ragù is definitely one of the most delicious pasta sauces. 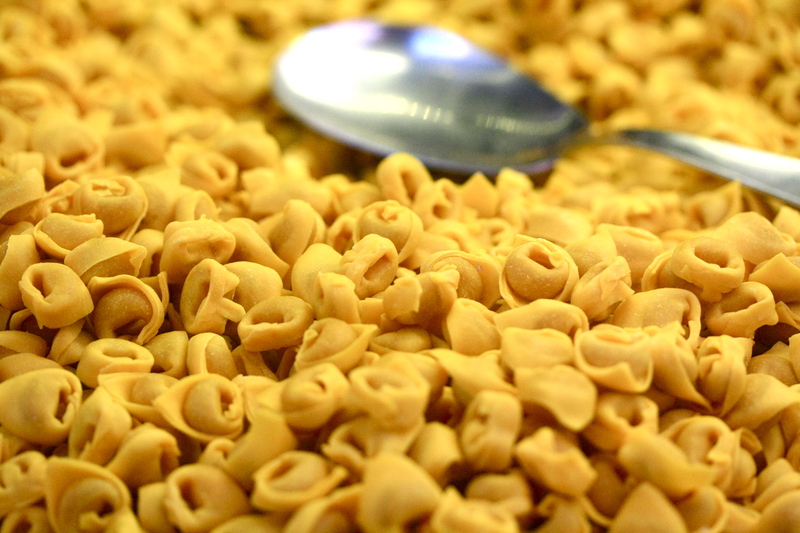 It’s irresistibly meaty, savory, and warm, coating each piece of pasta in richness. It is one of the hardest things for me to resist as a vegetarian. So when I discovered the magic of tempeh ragù, I was really excited, even though it won’t fool anyone into thinking it is the real thing. I have never been a big fan of tempeh- the first and only time I had ever tried it was last year in the dining hall salad bar, where it was offered in raw chunks (really terrible)- so I never would have had this idea if it where not for my mom’s good friend Rita. She is a health nut from the region of Emilia Romagna (which is where ragù alla bolognese is from) and makes a killer ragù, and she made me ragù with tempeh when she invited me over for dinner and was trying to appease my dietary choices. 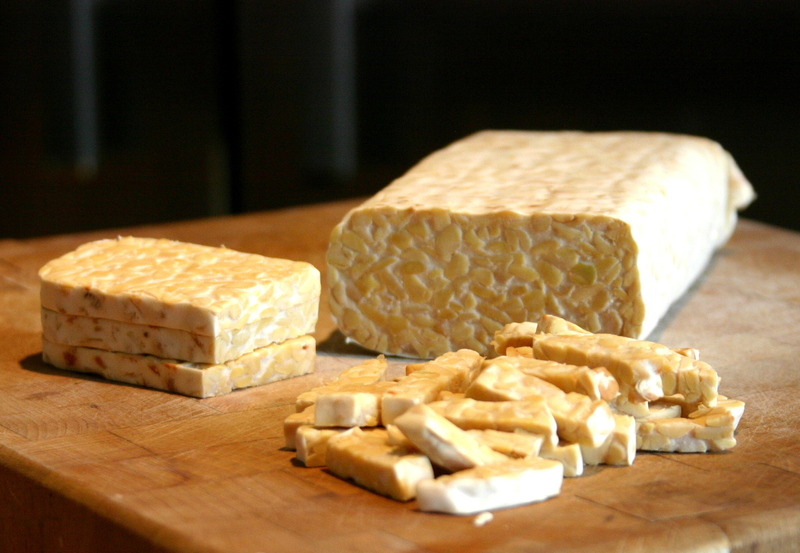 Tempeh is a fermented soy bean product that originated in Indonesia. Soybeans are soaked, dehulled, briefly cooked, mixed with something acidic, spread into a thin layer and left to ferment with the spores of the fungus rhizopus oligosporus. During the 24 to 36 hour fermentation process, the fungus knits the beans together with its spidery mycelium. Mmmm nothing gets the stomach grumbling like beans fermented with fungus, amirite? Tempeh is not at all like tofu, which is soft and bland, but rather has a very firm texture that is interlaced with small pieces of fermented soy bean and a nutty, slightly bitter taste. While horrible raw, once treated with a little marinade and fried in a pan, it becomes a satisfying vegetarian protein. For this recipe, it is chopped into small pieces so it looks like ground meat, and then cooked low and slow with aromatic vegetables, red wine, and tomato. To be honest, this recipe involves much more tomato than an authentic ragù recipe does, and that is mostly because I like a tomatoey sauce. If you want to make it like a real ragù alla bolognese, you need to add only a little bit of tomato paste. 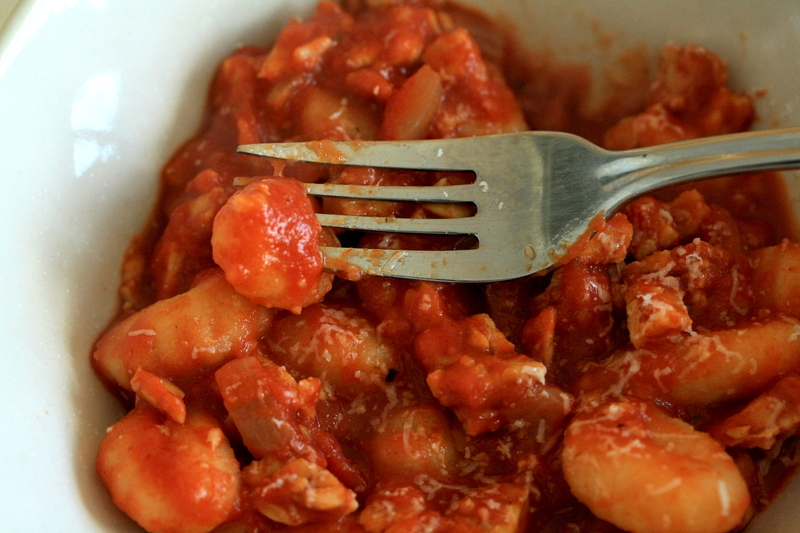 This sauce also goes great with pasta, but gnocchi are just wonderful little potato pillows for your mouth, so they take it to the next level. Next time you have that pesky vegetarian/vegan friend coming over, try making this! Dice the vegetables and chop up the tempeh until it is in pieces that resemble ground beef. Heat about 2 tbsp olive oil in a pot and add in the diced carrot, celery, onion, and herbs. Sautée on low heat until the onions are transparent and the carrot and celery have softened, then add in the wine and let it reduce. Add in the chopped tempeh and cook for about two minutes, letting it get a little browned. Add in the soymilk and bring it to a boil. Chop up the canned tomatoes and add them in with some juice from the can. Add salt and pepper to taste, then let the whole thing simmer for about 30 minutes until it becomes nice and thick. 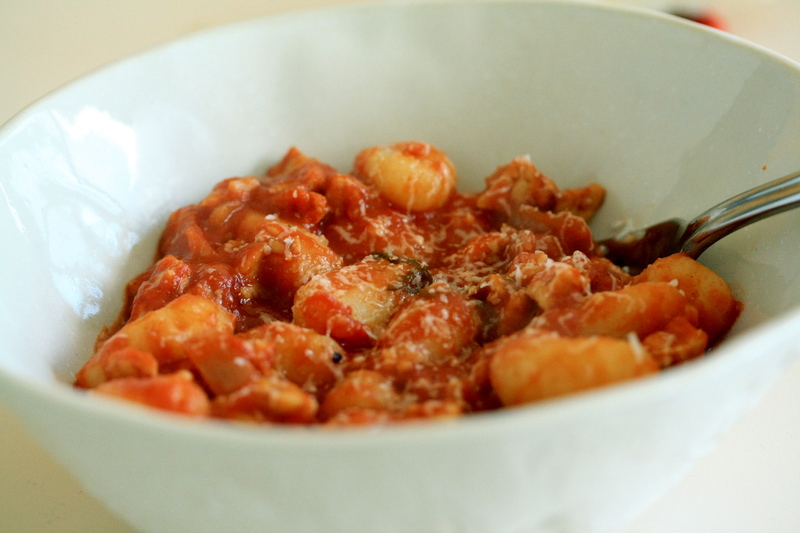 Once the sauce is done, bring some water to a boil and boil your gnocchi for about two minutes, or until they float to the surface. 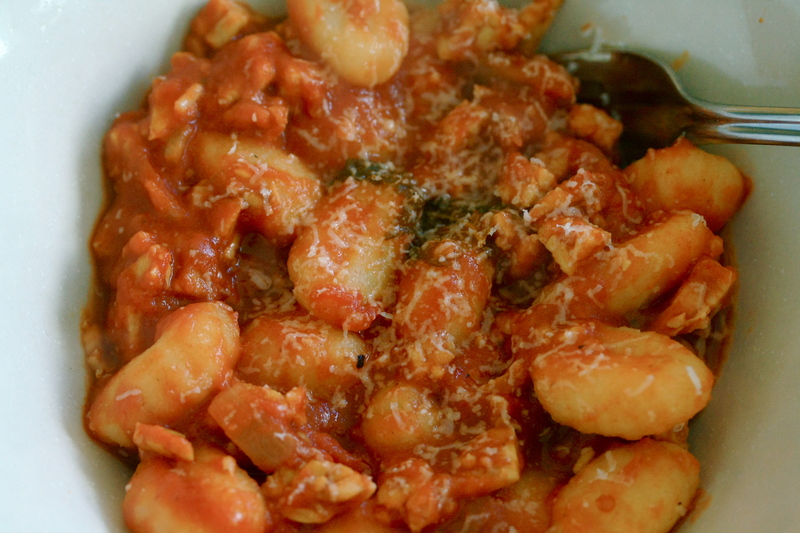 Toss them with the sauce, grate some parmiggiano on top and enjoy!